The Cook Inlet Beluga whale is a NOAA Fisheries “Species in the Spotlight.” Listed as endangered under the U.S. Endangered Species Act, this population of beluga whale may be at risk of extinction. An agency-wide effort is underway to protect it along with seven other high-risk species. July is Habitat Month. In this feature, we highlight ongoing research that helps us identify key areas where belugas live. Results from many years of NOAA survey work via plane, opportunistic sightings, and satellite tracking indicate that the seasonal range of the beluga whales in Cook Inlet, Alaska, has dramatically contracted since the early 1990s as the size of the population has decreased. The population appears to be consolidated in its preferred habitat in the uppermost reaches of Cook Inlet. “Understanding the habitats these animals use is key to not only helping them to recover but also preventing their extinction. We need to identify sensitive breeding, feeding, and nursery areas and areas of overlap with human activities. Our survey work provides some answers,” said NOAA Fisheries’ Kim Shelden. Kim is a marine mammal biologist with NOAA’s Alaska Fisheries Science Center. This endangered beluga population lives in close proximity to Anchorage, the largest city in Alaska. A lot of activity occurs on the waterways that surround Anchorage from fishing and shipping operations to air traffic, oil and gas development, and military operations. Through ongoing research, scientists gather data to assess the magnitude of human activities on this small, genetically isolated population of whales. The first aerial surveys to assess beluga whales in Cook Inlet were conducted in the 1960s, but it wasn't until 1977 that dedicated surveys began, primarily in response to proposed gas and oil leasing and hydroelectric projects in Cook Inlet. Since the early 1990s, ongoing, systematic surveys have been done. In fact, Shelden and her team just completed a two-week aerial survey in June. 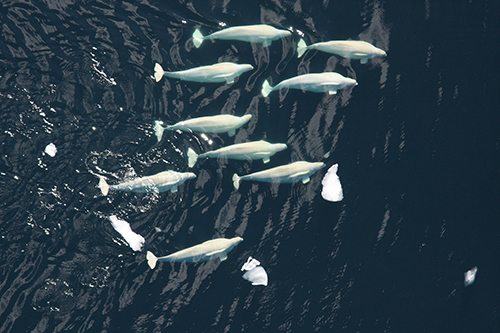 Information collected during these aerial surveys combined with data recorded by partner organizations and observations collected opportunistically provide the basis of scientific understanding about key beluga habitats in Cook Inlet. However, a limitation of aerial surveys is that they are restricted to times of the year when the weather is good – during summer months. This is also when whales aggregate to feed at river mouths so it is easier to count them. 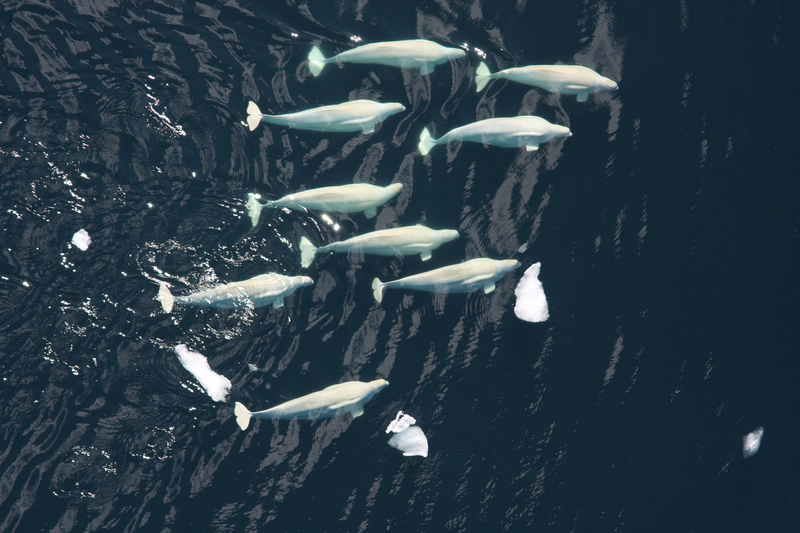 At other times of year detecting and monitoring belugas is more difficult due to the combination of poor sighting conditions (low light levels, white whales among ice floes) and whale behavior (close association with ice, longer, deeper diving patterns and the formation of smaller groups). In the late 1990s, scientists began to get a more complete picture of the year-round distribution of belugas in the inlet. Satellite tagging and tracking of 18 belugas, from 1999 to 2002, has helped to fill in the gaps by providing the first documentation of where individual whales spend summer, fall, winter, and spring. 1999 Time lapse video of beluga whale movements in Cook Inlet, Alaska. 2001 Time lapse video of beluga whale movements in Cook Inlet, Alaska. 2002 Time lapse video of beluga whale movements in Cook Inlet, Alaska. 1999, 2001 and 2002: Time lapse videos of beluga whale movements in Cook Inlet, Alaska. Video credit: NOAA Fisheries. Your web browser does not support this video player. To view to this video clip download this MP4. 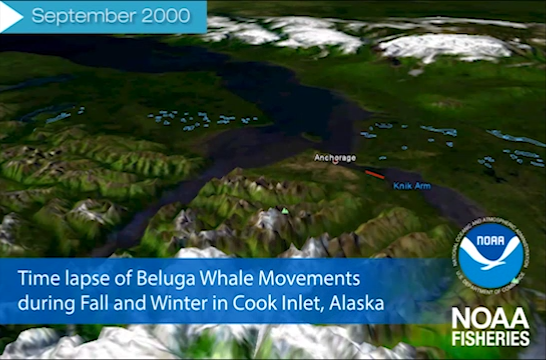 September 2000 - January 2001: Time lapse of beluga whale movements during fall and winter in Cook Inlet, Alaska. Video credit: NOAA Fisheries. In recent years, nearly the entire Cook Inlet beluga whale population is found in only northern waters from late spring through the summer and into the fall. This differs markedly from what scientists observed during their surveys in the 1970s, when whales began to disperse to the lower inlet by midsummer. By early June, belugas gather at river mouths in the Susitna Delta and in Chickaloon Bay. Since 2008, 83 percent of the total population now occupies the Susitna Delta by early June compared to roughly 50 percent in the past when whales were also found in Knik Arm. In August, sightings increase in Knik Arm, with some dispersal into deeper waters off Trading Bay. In fall, belugas begin to separate into smaller groups. They explore deeper waters of the upper inlet and coastal areas. Some also enter the lower inlet for brief periods. Winter sightings have increased in the upper inlet and tagged whales continued to enter coastal areas despite heavy ice conditions. There is no evidence of migration out of Cook Inlet. NOTE: This PDF includes the appendices referenced in the print version, footnote 13.